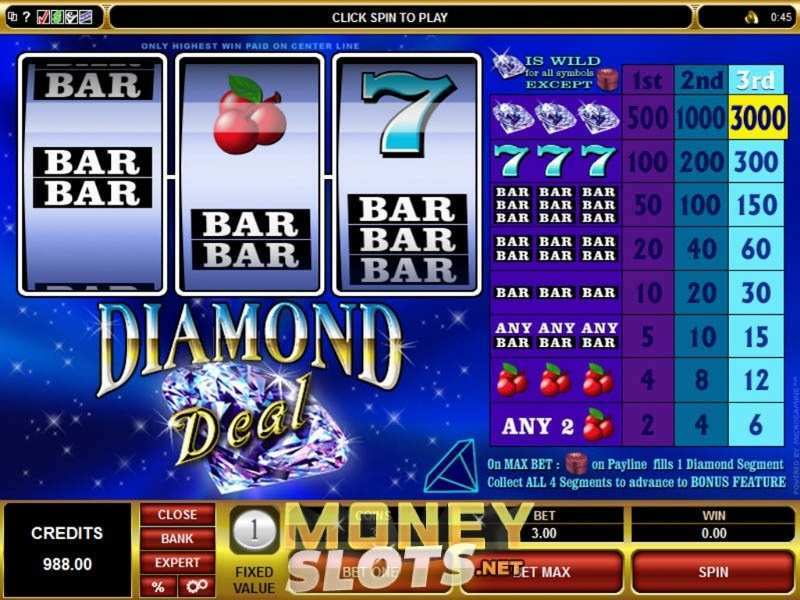 Diamond Deal is the Microgaming’s three-real classic slot machine inspired by, as the title suggests, bright silver gems both on the reels and in the backdrop. Next to diamonds, the slot features the well-known bar, cherries, and sevens, the first symbols ever to appear in video pokies. Regular – This is a simpler mode where only stake settings are at your disposal. If you have any misunderstanding about how to play this casino machine and want to find out more before playing for real money, just click the “Help” mark and view all the explanation in a new window. Scatters are known as icons that enable Free Spins. However, in some versions of Diamond Deal slots, the addition is not available. Once all four Diamond segments are landed, a new screen will open for you. Now, it is up to you to pick among a bunch of boxes by clicking and revealing what is behind. This will bring random price rewards to a player. The extra symbol here is also the well-known Wild icon that takes on a role of another symbol to help you form a winning combo. When you play free Diamond Deal casino slot machine, you will find that the wager system doesn’t have a wide range. It is the best for those with small budgets who don’t want to spend more than a couple of coins on a spin. Hence, the range can be set at one Coin size – meaning that the bet is 1.00, and up to the maximum of three Coins, leading to the bet of 3.00. Microgaming created this pokie with only one line to play on, with a straight horizontal pattern. If you are from UK or any other world country and wish to play with no download or registration, you will receive free credits for practice. If Diamonds are your favorite theme, pick among more casino machines such as Serengeti Diamonds, 7 Dwarfs Diamonds, or Diamond Bonanza. 0 responses to "Diamond Deal Slot"